Today’s aerospace factory floor is nothing like the hectic, noisy production facility of the past. The latest techniques, designs, and equipment make modern manufacturing efficient, organised, and structured. And what about tomorrow? The future of the aircraft factory is pushing emerging technologies to improve the competitiveness of Airbus manufacturing processes where manual operations are still predominant today. 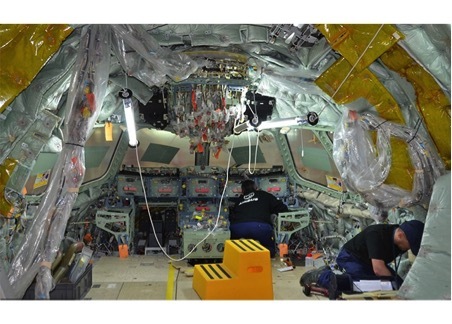 Using National Instruments (NI) System on Module Airbus is developing three smart tool families to improve airplane production efficiency. Manufacturing and assembly of aircraft, involves tens of thousands of steps that operators must follow. A single mistake in the process could cost hundreds of thousands of dollars to fix, making the room for error very small with many checks in place to ensure quality. By adding intelligence to the system, the smart tools understand the actions that the operator must perform next and automatically adjust the tools to the proper settings, which simplifies the task for the operator. Once the action is completed, the smart tools can also monitor and log the results of the action, which improves the efficiency of the production process. As an example, a given subassembly of an airplane has roughly 400,000 points that need to be tightened down, which requires over 1,100 basic tightening tools in the current production process. The operator has to closely follow a list of steps and ensure the proper torque law settings for each location using the correct tool. Because of the manual process, human error adds a lot of risk to the production. This is significant since even a single location being tightened down incorrectly could cost hundreds of thousands of dollars in the long run. A smart tightening tool understands which task the operator is about to perform using vision to process its surroundings and automatically set the torque. The device can record the outcome of the task in a central database to ensure the location was set properly. With the central manufacturing execution system (MES) database and the distributed intelligence of the devices, production managers can precisely pinpoint the procedures and processes that need to be reviewed during quality control and certification. Airbus is launching the development of three smart tool families that perform different manufacturing processes: drilling, measuring, and quality data logging and tightening. Adding intelligence to the tools and shop-floor systems to help simplify the production process and improve production efficiency by managing and checking the tasks the operator is completing. Using the NI System on Module, they can quickly prototype these smart tools. Retrieve acceptable measurement values from a database, check that the measurement is within the parameters, log results and provide follow-up actions if necessary and finally perform automatic checks/calibration. We tested the NI SOM as the foundation platform for all of these smart tools because of the ubiquitous architecture and framework that it provides to accelerate the development process from design to prototyping to deployment. Before developing on the NI SOM, we were able to create a prototype based on an NI CompactRIO controller (cRIO-9068) that allowed us to integrate IP from existing Airbus libraries and open-source algorithms to validate our concepts quickly. The flexibility of using graphical and textual programming along with reusing third-party development ported on top of the Xilinx Zynq and the NI Linux Real-Time offers the perfect level of abstraction for developing these tools. We can now reuse the code that we have developed on the NI SOM as a deployed solution rather than having to restart our entire design process. We evaluated several SOMs and embedded single-board computers (SBCs), and there is no comparison to the platform-based design approach and the hardware-software integration offered by NI. We estimate that our time to deliver with the NI SOM is a tenth of the time using alternative approaches because of the productivity gains of NI’s approach to system design, particularly with NI Linux Real-Time and the LabVIEW FPGA Module. 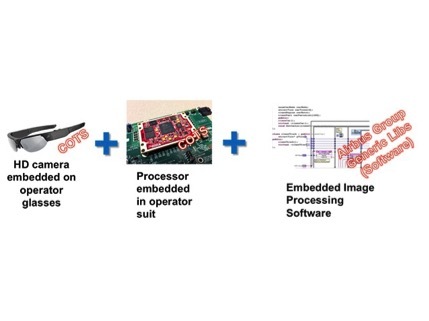 With the software already provided by the NI SOM, we can focus more on the key features of our system such as image processing on FPGAs. Factory of the Future at Airbus is an incremental long-term research and technology project that is critical to our competitiveness in manufacturing processes. Rapid development is critical for our incremental approach of new technology, from initial proof of concept development to real object dissemination. We have carefully planned this initiative over the past few years, and with NI technology, we can accelerate our development process and bring our vision into reality.